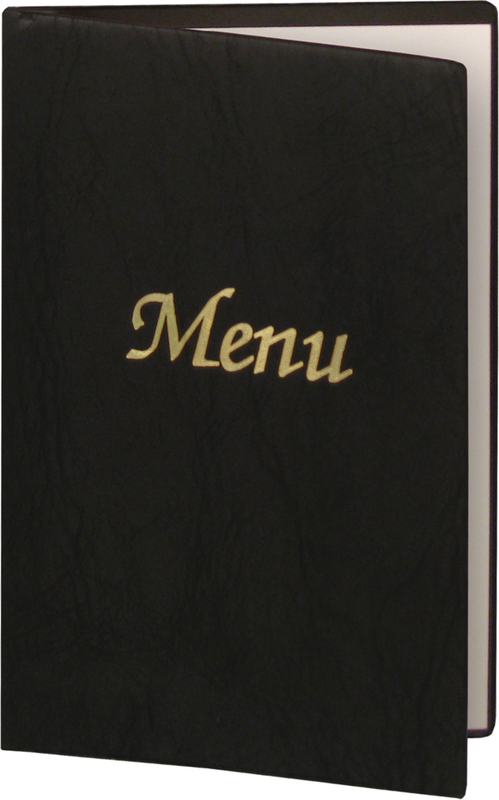 or IMPRINTED BLACK VINYL MENU COVERS! or STANDARD ' MENU ' GOLD FOIL IMPRINT! 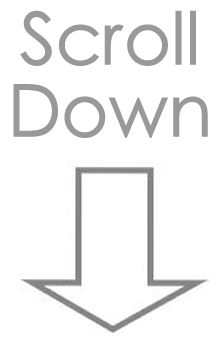 nursing homes, hospitals & cafeterias. to give these inexpensive menu covers firm backbone. With the two clear heat-sealed center-load pockets on the inside, you'll have 2 views. Minimum: 2 dozen. 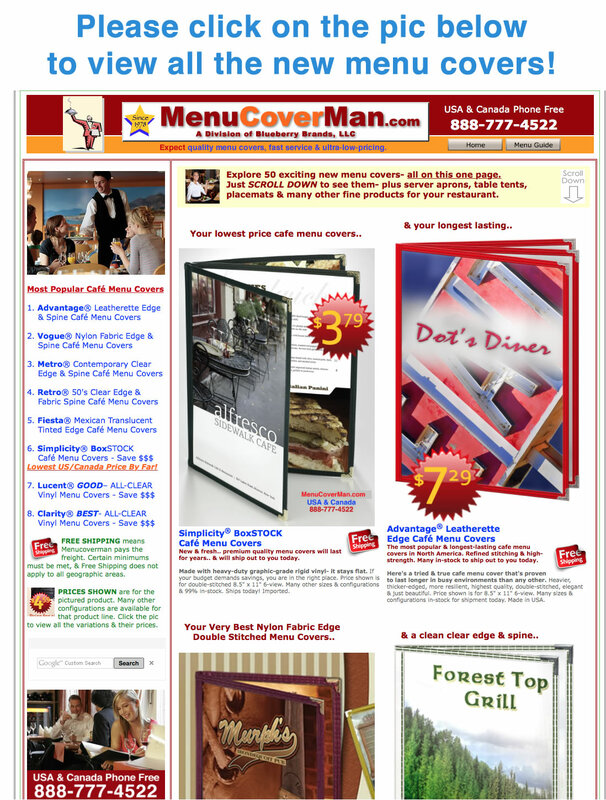 Prices shown are PER DOZEN MENU COVERS. Black Vinyl Menu Covers can be ordered blank, or you can have your logo and/or imprint added to the cover, or you can have the classic " Menu " gold-foil stamping, as shown in the picture to the left. Please allow 5 to 7 business days for blank, & up to 14 business days for imprinted. The minimum for imprinting is 3 Dozen covers. A one-time die charge is $75; we'll keep the die on file, & your next order is imprinted free. There's no charge for just the " Menu " in gold, shown to the left. Guaranteed $14.50 Flat Rate Shipping anywhere in the lower 48 states. Slightly higher to Canada, Alaska, Hawaii, Guam & Puerto Rico. IMPORTANT NOTE: These covers have no stiffener backing. You can use them as they are, or you can add chip board to make them rigid and less flexible. CLICK to add them. • Please call 888-777-4522 in the USA & Canada if you'd like your menu covers imprinted or if you want the standard Menu inscription shown to the left. It's very inexpensive, yet still gives you the look! Two Clear Heat-Sealed Pockets for Two Views.